The developer created a very easy way to import third-party map data directly in the map viewer, as I will show in the next slides. It is the only viewer I know of that supports the UTF grid. This means that it can show additional information about the vegetation, e.g., for your current location or a location you indicate on the map. There are two versions – a free version and a pro version. The pro version has no advertisements and adds some extra tools like weather data, geocaching, and navigation. Visit http://www.locusmap.eu/download/ for a complete comparison of the two versions. This tutorial applies for both the free and pro version. Click on any of the images below to view them at larger size. 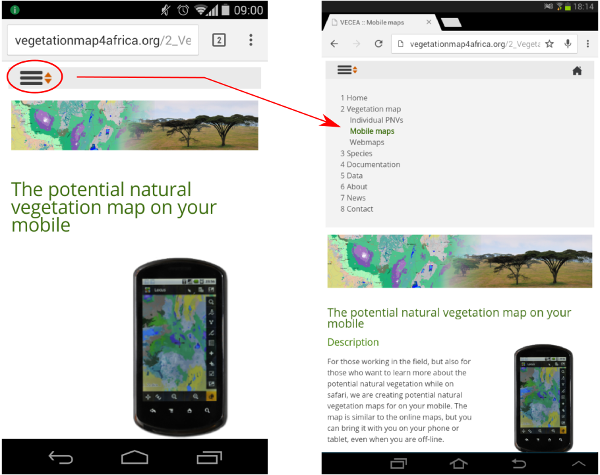 To download the maps, open the vegetationmap4africa.org website in your mobile browser and go to the Mobile map page. You can use the menu, or click this link to go there directly. On the download page, scroll down to the download sections. 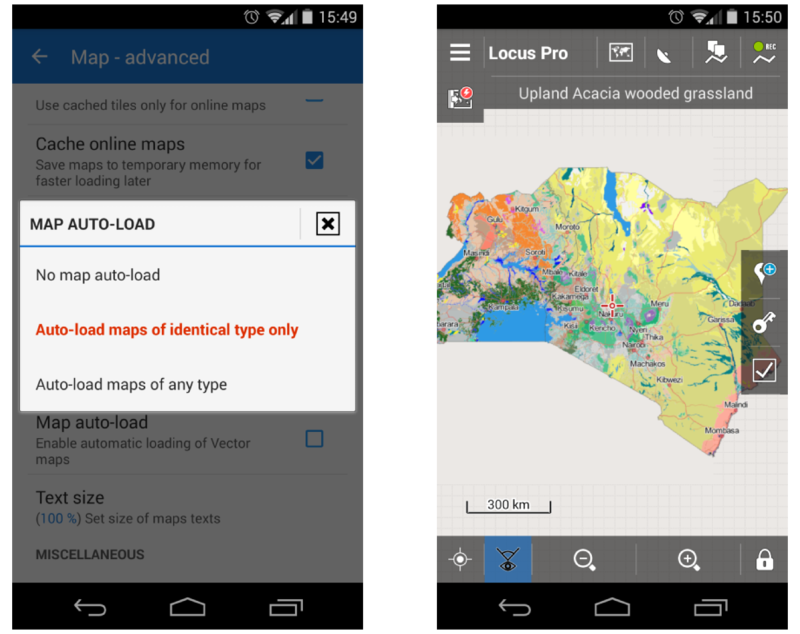 You have two options for the Locus map viewer (1). 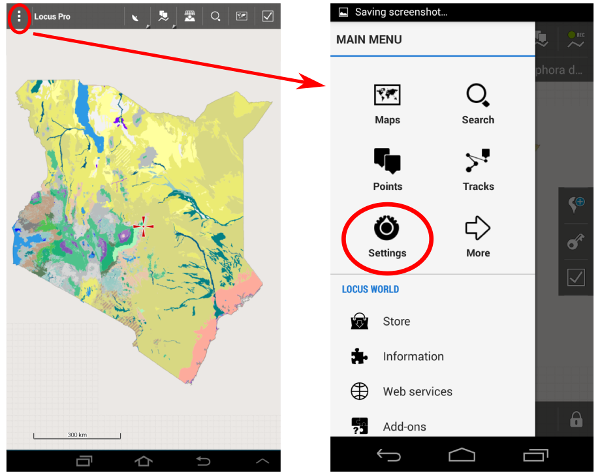 The first option is to download the maps without the accompanying vegetation fact sheets. Advantage is a smaller download size, but to access the fact sheets you'll need to have Internet connection. 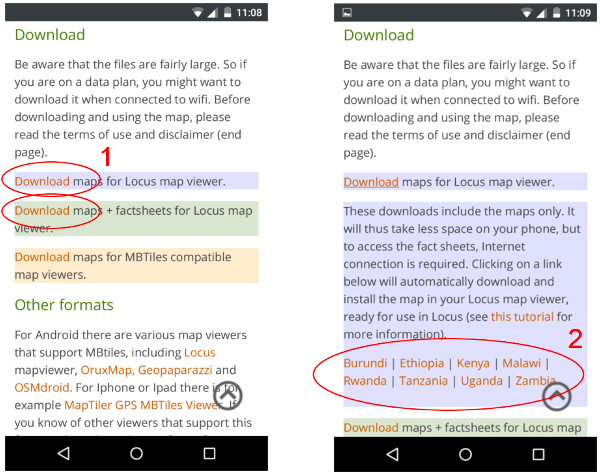 The second option is to download the map with the accompanying fact sheets. This means a larger download size, but you'll be able to use the map and fact sheets while off-line. Click on your preferred choice to open the list with download links. Select the country of interest and click the link (2). 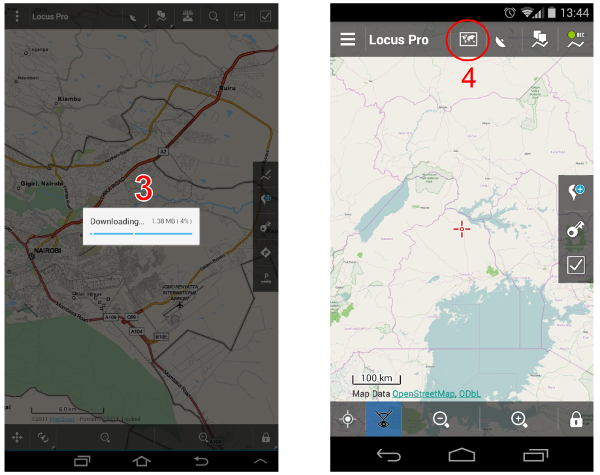 This will open Locus map viewer and start downloading the map automatically (3). Note that the direct download does not work on Firefox for Android. Other tested browsers, like Chrome and the stock Android browser should work. 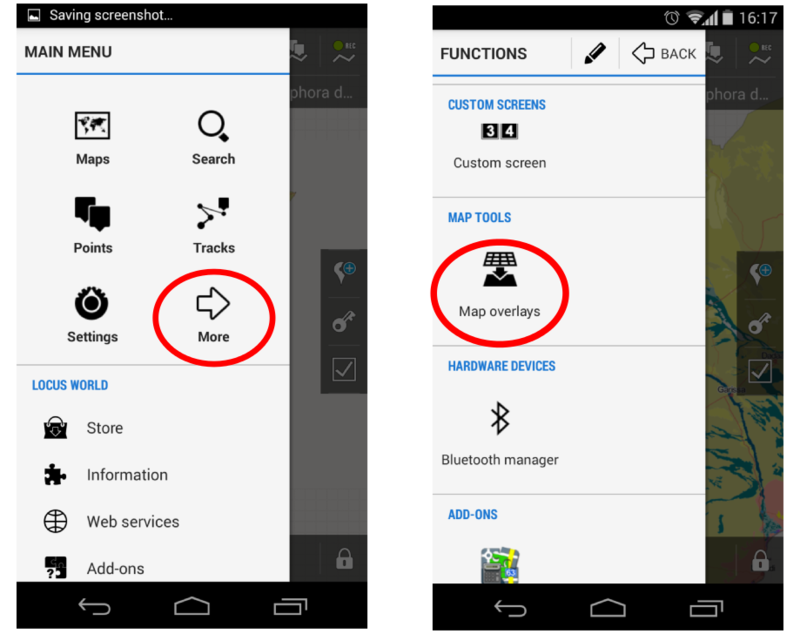 To open the map, first click on the little map icon (4). This will open a new screen where you can find various map online and offline map sources. Go to the OFFLINE tab and click the map you just downloaded. For more information about the map or to center the map when opening, click the three vertically aligned dots. Next select 'Map - advanced' and open the 'Map auto-load' option. 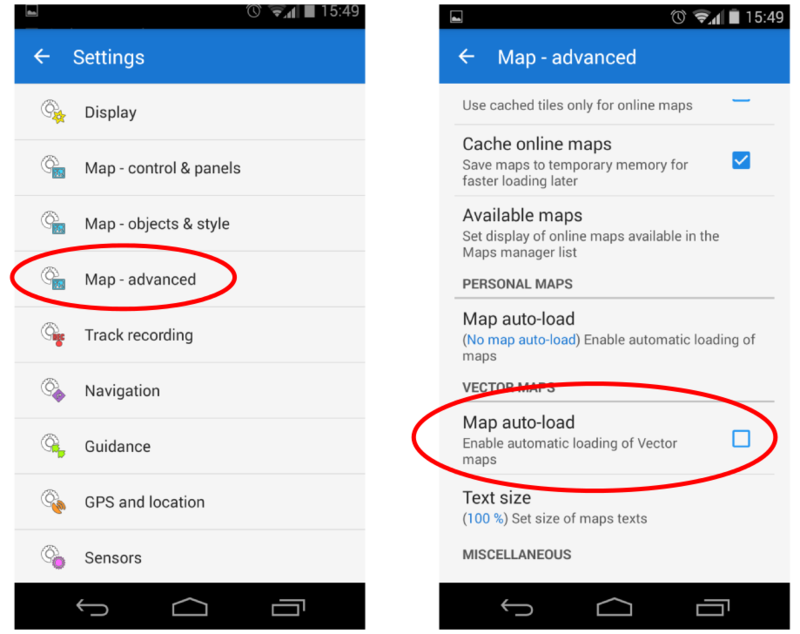 In the popup menu, select the second option (Auto-load maps of identical type only), and close the settings menu. 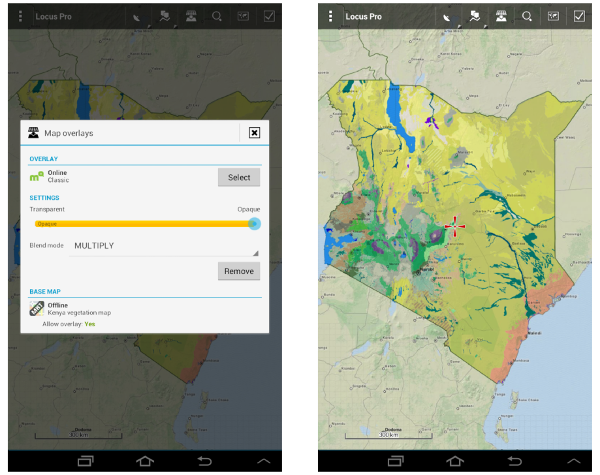 Now if for example you have downloaded the maps for Kenya and Uganda, both should show now. If you have the Locus map Pro version, you can overlay the map with other maps, using various ways to combine them (blend modes). Go to 'Settings' and select 'more'. 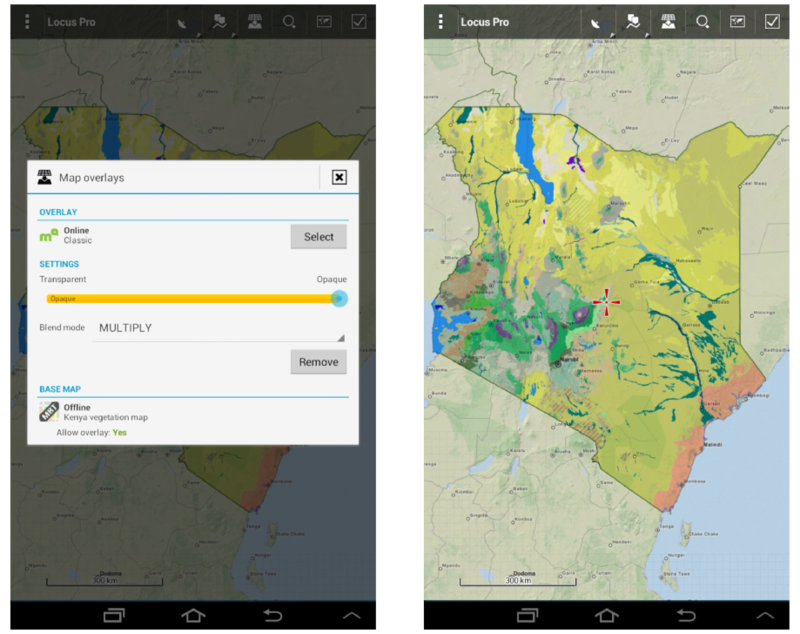 In the new panel scroll down to 'Map tools' and select 'Map overlays'. Note that you can add this function (and any other function) to the side or top toolbars in the main window as explained here. In the 'Map overlays' window, you can select the map to use as overlay, set the transparency and the blend mode. For more information about this function, see this help file. 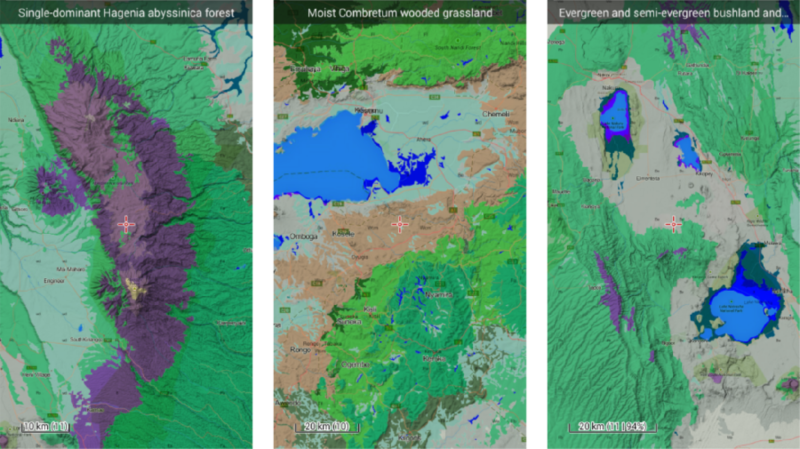 And some last examples of the map overlaid with the Google Terrain map, zoomed in on three different regions in Kenya. 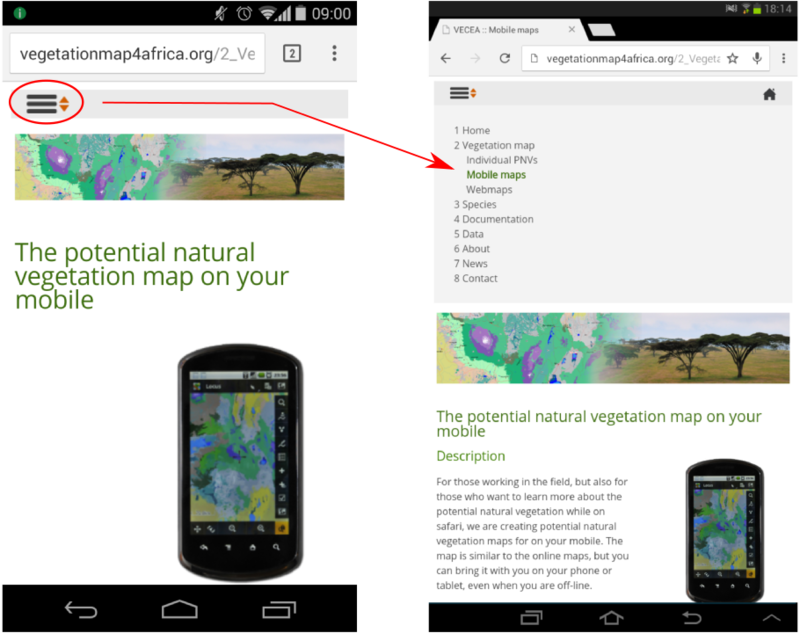 For questions or comments on this tutorial or the use of the mobile maps in general, please let us know. There are a number of known issues you may come across when dowloading the map or opening the fact sheets. After selecting a mobile map for download directly in Locus, some users have reported a short error message after the download was finished. In most cases, however, you can ignore this message, and is the map normally available. 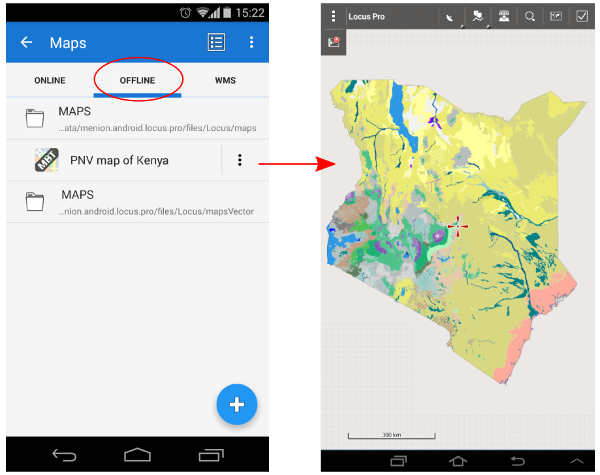 The Quick-Install of maps in Locus does not work from Firefox. Only solution for now is to use another browser. Your stock browser or e.g., Chrome should work.